It looks nothing like the college of your dreams — and that’s exactly why we should learn to love the state’s flagship campus. 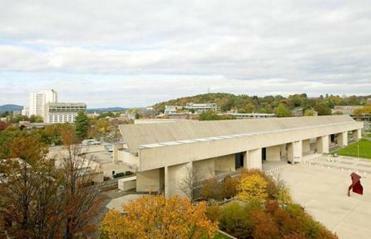 The Fine Arts Center at UMass Amherst. The campus of the University of Massachusetts in Amherst—founded 150 years ago—has all too often been summed up with a simple word: ugly. At least one online source awarded it the dubious distinction of being the second ugliest campus in the nation, behind only Drexel University in Philadelphia. Today the university is being reshaped. The building boom that began at the end of the century promises to remake the campus and its image. As the buildings of the great postwar boom head toward middle age, there are many who would be happy for the university to start over, wipe the slate clean, and make way for a completely new look. But the past several years have seen the stirrings of a different way to see the university. A growing number of faculty, staff, and students have come to appreciate the campus as something distinctive, not just oppressive. And in 2007, a new organization, Preserve UMass, was founded with the goal of saving not just the campus’s handful of surviving 18th- and 19th-century buildings, but also some of the modern structures that people find so uninviting. As a professor of architecture and history at the University of Massachusetts who grew up in Amherst watching those monumental structures rise from farmland, I count myself among the appreciators. In part, this revived enthusiasm is because UMass is home to examples of significant works by some of the most important architects of the mid-20th century. At a moment when Americans are starting to reassess the long-unloved architecture of the 1960s and ’70s, the UMass campus offers an outdoor museum of design from that period, including buildings by Marcel Breuer, Edward Durrell Stone, Skidmore, Owings & Merrill, and Kevin Roche. But something deeper is at work as well. Built into UMass’s campus, and the story of why it looks the way it does, is a set of ideals about what a public university was and might again be. After three decades of a broad national push for smaller government and privatized institutions, and in the midst of our own statewide debate about taxes, the monumental buildings that helped transform UMass into a major research university remind us of very different principles: the belief that long-term public investment is a value rather than a burden; that working-class as well as wealthy students deserve outstanding learning facilities; and that excellent higher education should be affordable to all. Well into the 20th century, the Massachusetts Agricultural College did not look so different from other New England colleges. It remained a quiet, open campus of modest buildings serving no more than 500 students at a time. North and South Colleges were joined by a collection of Colonial era homesteads, an elegant Romanesque chapel, and a couple of Queen Anne-style scientific “experiment stations.” Its first significant expansion—when it became the Massachusetts State College in 1931—included a spate of Harvard-inspired red-brick, neo-Georgian buildings. UMass Amherst Whitmore Administration Building. The campus we see today was born after World War II, when the GI Bill, which offered virtually free higher education to returning veterans, led the institution to take on bigger ambitions and a new name: the University of Massachusetts. President John Lederle, who led the campus in the 1960s during its era of greatest growth, saw this expansion as an opportunity to build “a great public center for excellence in higher education.” “We have in the University of Massachusetts,” he said, “a potential giant.” By 1972, the university had over 23,000 students, and over 10 million square feet of space was built during the 1960s and 1970s to accommodate them. This modern public research university was something very different from the exclusive private colleges for which Massachusetts was known, and its leaders believed that mission demanded a different look. Instead of mimicking the exclusive private schools that had long trained New England elites, UMass would proclaim its distinctive belief in excellence combined with broad educational access for the masses by embracing the architecture of the day. With plans developed by Sasaki and Associates, and with advice on architects from MIT’s Pietro Belluschi, Lederle ushered in the modernist icons that would be built over the course of the 1960s and early 1970s: the Southwest Residential Area, by Hugh Stubbins; the massive Fine Arts Center complex designed by Kevin Roche; the Lincoln Campus Center by Marcel Breuer; and the McGuirk Alumni Stadium, designed by Skidmore, Owings & Merrill. At the time it was built, in 1973, Edward Durrell Stone’s library tower was the tallest building in New England west of Boston and the tallest library in the world. The side of a parking garage on campus. These daring buildings were met with enthusiasm, at least in the architectural world. Architectural Record devoted a sizeable section of its May 1966 issue to a survey of what it called “Distinguished Architecture for a State University.” The issue praised the new buildings as “masterful” and called the UMass approach a model for expanding postwar colleges. Like many buildings of the period, however, UMass’s onetime landmarks have fared poorly over the years. 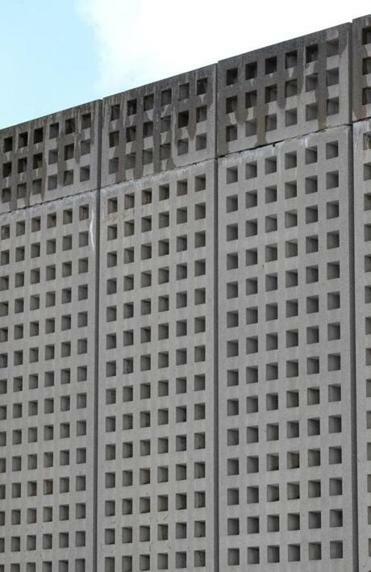 The Brutalist concrete monoliths of the 1960s and ’70s have had an especially hard time finding support. In a story familiar to anyone who has spent time in Boston City Hall, what were initially bright, sculptural forms gave way over time to stained facades, chipped corners, and broken stairs. The 1960s and ’70s boom was followed by two decades of disinvestment in the university’s physical plant, as a cash-strapped state government scaled down its ambitions. Student growth halted, few new buildings were built, and maintenance on existing ones virtually stopped. Many complaints about the buildings—including the Fine Arts Center, which houses my program, Architecture + Design—can be traced to the lack of maintenance during this period. At the same time, real failings in design, construction, and repair coincided with a growing conservative backlash against the New Deal and Great Society. 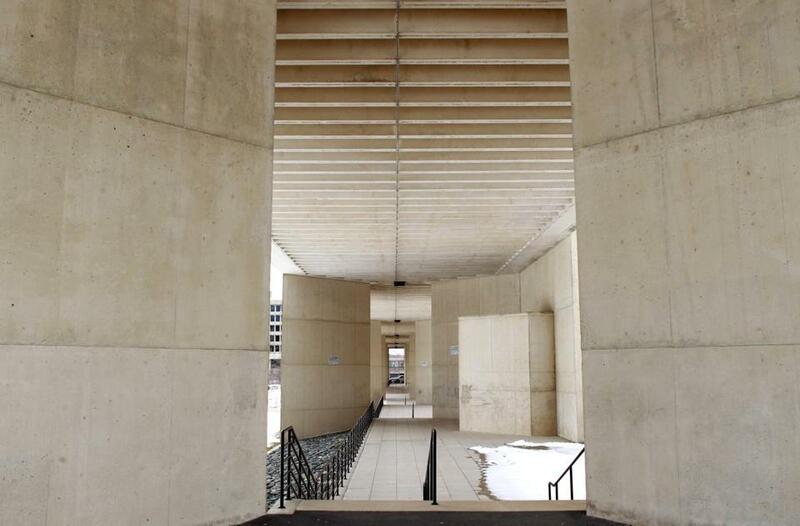 By the end of the 1970s, the buildings that Lederle had envisioned as marking the start of UMass’s limitless, democratic rise came to be seen by many as hulking monuments to governmental excess and corruption. UMass Amherst Lincoln Campus Center. At present, this campus of aging mid-century icons is in the midst of a new kind of building boom. “New Dirt” was the slogan of Chancellor John Lombardi, who during his term from 2002 to 2007 sought to have UMass finally join the ranks of top national research schools, with impressive facilities to match. Over the past 15 years, the land of this plateau has been dug up and concrete foundations poured at a rate matched only by the Lederle era. As the building boom has taken hold, the school’s older buildings have drawn the attention of architectural preservationists. Preservation Massachusetts, a statewide nonprofit organization, named the UMass Amherst campus one of the Bay State’s “10 Most Endangered Historic Resources.” Preservationists have pressured successive campus administrations to deal more thoughtfully with historic buildings and landscapes, whether they be old barns (torn down to make way for the Recreation Center), the Campus Pond (whose edges are being remade to accommodate the New Academic Classroom Building), or the Fine Arts Center (which has been nipped and tucked in all manner of ways). 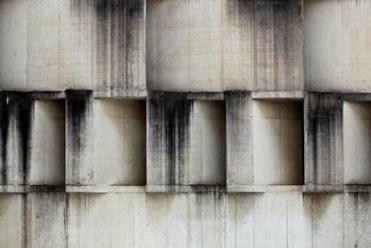 No one wants or expects the school to be frozen as a museum of 20th century Brutalism. But under the watchful eye of Preserve UMass, a new appreciation of the campus’s unique architecture is growing, among the campus planning and facilities staff, as well as the broader UMass community. The challenge UMass leaders face now is twofold: preserving and sensitively restoring the most important buildings and landscapes, and, at the same time, spending the time and energy (and state money) necessary to attract today’s visionary architects, so that we will have buildings worth saving 50 years from now. UMass campus. But it is worth thinking about what “ugliness” means. The buildings that we—as individuals and a society—now think ugly we might later see differently, finding in old architecture new meanings. When brownstones and rowhouses seemed old and dowdy, urban planners wiped away acres of good housing. Now, seeking reinvigorated neighborhoods, we crave those solid homes that shaped street life and strengthened communities. Dozens of young colleges in the United States sought gravitas and a connection to an ancient European heritage by building in a gothic style identified with Oxford and Cambridge universities. Today, we would be unlikely to find that a sensible way to build a campus. If we pay attention, we can sometimes find in buildings from a past age something we are missing in our individual or collective lives in the present. We may be drawn, as the writer and philosopher Alain de Botton has put it, to those qualities which we lack and which we seek to possess. In our age, when the very notion of government’s role in social betterment is under attack, UMass buildings from the golden age of public higher education stand for a faith in the public sphere. It’s possible to look at the library and see only the chips that once fell from bricks in the upper story, or think about its history of out-of-service elevators. But it’s also possible to stand in awe at the idealism of building the world’s tallest library, open to anyone, 24 hours a day. The Fine Arts Center represents a moving decision to ask one of the premier architects of the day to design first-class art, music, and theater spaces for the sons and daughters of working men and women of Massachusetts. Who today would even dare to design—as Roche did for the Fine Arts Center—a 646-foot-long bridge of studio art space, and raise it up 30 feet from the ground to create a monumental gateway for a campus? 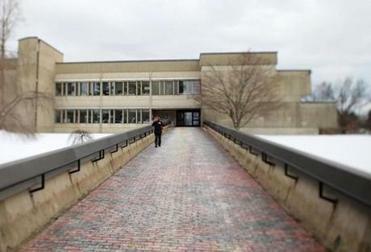 UMass’s buildings have not always been worthy of those dreams. But there are those, and I’ll include myself in this category, who believe that in deciding how to equip a University of Massachusetts for its next 150 years, we should not see the heroic buildings of the 1960s and 1970s as the enemy. Rather, they are landmarks, pointing to what must always be the founding ideal of our flagship campus: public investment in our public schools, and a belief that precisely this kind of institution is the cornerstone of democracy. Max Page is professor of architecture and history at the University of Massachusetts Amherst and coauthor, with Marla R. Miller, of “The University of Massachusetts Amherst: The Campus Guide,” published by Princeton Architectural Press.